Blue Lagoon Art by Sharon Cummings. A refreshing treat for Summer! We’ve been remodeling our home for the past 2 months and a new pool is going in next month. I’ve been so busy with the house, that my art has had to take a back seat for a little while. I am so ready for a Summer Vacation. Are you? Tango 2 is a vibrant red and black abstract painting by Sharon Cummings, modern artist. All of my artwork comes as fine art prints on canvas, metal, acrylic, wood and framed. #beach #women art by Sharon Cummings, artist. 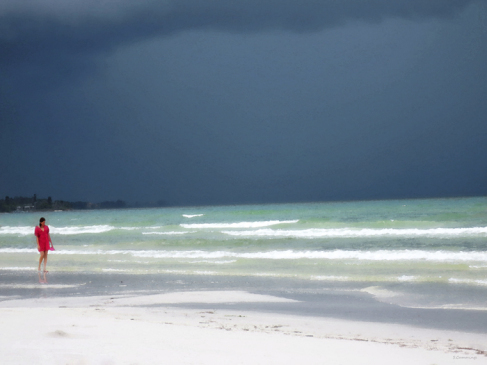 In a calm moment before a storm broke out on Siesta Key Beach, I look up and down the coastline and spot a lone woman walking slowly beside the waves. Her dress catches my eye immediately. The bright red in direct contrast to the darkening surroundings. She carries her matching shoes in one hand. She appeared completely unconcerned by the ominous clouds forming overhead. What was she thinking about? A lost lover…..her career choices….the baby she gave up for adoption….her next novel….I will never know, but I find this image incredibly seductive with so many possibilities…..
#modernart #art by Sharon Cummings, artist. Fill your vessel with soothing art. New artwork by Sharon Cummings. An earthy blue and neutral abstract painting with a pop of life! #abstractart by Sharon Cummings, artist. From my “Pieces” series. Modern art number 9. Vivid colors and a contemporary style. Perfect for any space in your home or office. #colorfulart by Sharon Cummings, artist.